I think tracking inventory is critically important, at least for the type of game I run. But I also don't want to be looking over every character sheet between sessions. I try to make it super clear how inventory and encumbrance works in my game and give the players the tools they need to keep track of everything. In my game every item is assigned an ENR (encumbrance rating). Each character can carry up to double their brawn score (not modifier). 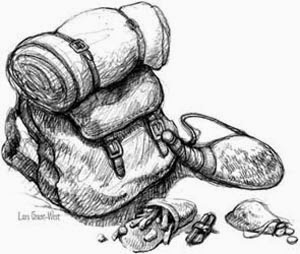 If a character is carrying more than their brawn score they are considered over-encumbered and take penalties on dexterity and brawn checks as well as initiative checks. Most items carried are considered to be "in pack" or otherwise stowed away securely. Up to four items may be designated as "on belt". Stowing or retrieving any in-pack item takes 1 turn. Items on-belt are considered to be "quickdraw" so a character can stow or retrieve belt items without spending a turn to do so. In addition to belt and pack storage each character is also considered to have a purse on their belt. A purse can hold up to 49 coins or gems and does not have an ENR. Any sum of coins greater than 50 counts as 1ENR. Additional coins must be stored separately in pack. Spyglass 200gp 2 This fragile item may be used to view distant locations in startling detail. Traveller's Tent 5gp 5 This bundle of wooden poles and canvas may partially shelter up to 2 adult humans. Better than nothing when it rains. Army Tent 15gp 8 This bundle of wooden poles and canvas offers reliable shelter for up to 4 tightly packed adult humans. Pavilion Tent 50gp 12 This heavy bundle of wooden poles and canvas offers excellent shelter for up to 10 tightly packed adult humans. Often used by nobles, wealthy merchants or military officers. Tinder Box 5gp 1 A small box containing flint and steel as well as dry wood shavings. Used to easily light fires. Tobacco Pouch 1gp 1 This small waterproof pouch holds 10 doses of tobacco. Torch 1gp 1 This small piece of wood has been treated with a fire resistant resin but is otherwise identical to a club until a torch rag is tied one end and lit. (5 rags in sack) 5sp 1 These pitch soaked rags will burn brightly, steadily and slowly. Each rag will burn for 1 hour if attached to a torch. (with cork) 5sp 1 Fragile. Holds about 2 pints of liquid. If used as a weapon the bottle is treated as club for first hit and thereafter as a dagger that can't be thrown. 1 empty A stitched leather bladder. Holds about 3 pints of liquid when full. Tin Whistle 1gp 0 Makes a loud high pitched noise when blown into. (bottle) 1gp 1 See the glass bottle entry above. A bottle of hard liquor can be turned into a molotov in 1 action with a torch rag and flame. - May consume 2 uses “medicinally”. 2 empty Holds about 6 pints of liquid. May be used medicinally for up to 6 uses. 3 empty Holds about 10 pints of liquid. May be used medicinally for up to 10 uses. 1 empty Fortified wine is laced with tonics and restorative medicines plus the biting flavor will shock the drinker into wakefulness while the liquor dulls pain. Holds 3 medicinal uses. Sturdy Iron-shod Boots 5gp 1 worn or carried These tough iron and leather boots are the best protection available for an adventurers' feet. See the armour section for more information. Sturdy Gauntlet 5gp 0 (1 if carried) Most of the heavier types of armour come with a set of gauntlets but sometimes even lightly armoured warriors choose to wear them. Healer's Pouch 5gp 1 Contains clean bandages, herbs and ointments. 10 uses. Good luck with your plans, and keep posting!